FINALLY posting a recipe for this perfect, every-day, good on EVERYTHING, super flexible and delicious VINAIGRETTE! After making this for the last year, I'm finally getting around to sharing the love. I like a little sweetness in my salad dressing, but these days, I've been trying to stick to natural sweeteners. In THIS recipe, the unexpected star of the show that lends some sweetness AND awesome texture to the dressing is... (if you haven't guessed it by the title)... APPLESAUCE! If you don't eat applesauce often, just buy the little cups like I do! The unsweetened "store brand" variety is my go-to. BONUS, the plastic cup acts as your measuring cup for the oil and vinegar (since this recipe is based on equal parts of all three). Easy. Healthy. Tasty. What more could you ask for? Salad! (go figure). It's especially good on salads that have a little goat cheese or feta, but really it's good on any salad. I hope you love it as much as we do. it has truly become a staple in the Barton kitchen! And it's the PERFECT dressing for this Strawberry, Quinoa, & Goat Cheese Salad. 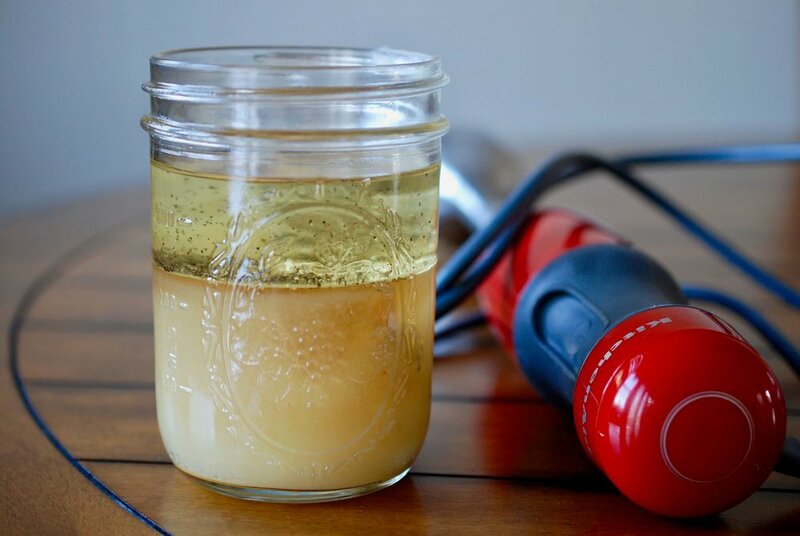 Combine all ingredients in a mason jar or the container that came with your immersion blender. EITHER put a lid on the jar and shake REALLY well, OR use your immersion blender to blend everything together! TIP: I prefer the consistency with my immersion blender, but in a rush, I've just shaken everything together and it turns out fine!. You could also blend in a food processor, Magic Bullet, or normal blender! Note: Due to the olive oil, this dressing might get kind of clumpy/thick in the refrigerator. You can sit it out at room temp for a bit before you plan to use it or microwave it very briefly to thin it back out.